VATICAN CITY (CNS) — Days after he called on Pope Francis to resign for allegedly ignoring sanctions placed on then-Cardinal Theodore E. McCarrick, Archbishop Carlo Maria Vigano provided his version of a meeting that, in the minds of many, changed the overall narrative of Pope Francis’ visit to the United States in 2015. Archbishop Vigano, then the nuncio to the United States, had arranged for the pope to meet privately at the nunciature in Washington with Kim Davis, the county clerk from Kentucky who was jailed for refusing to issue marriage licenses after the U.S. Supreme Court ruled gay couples have a right to marry. Juan Carlos Cruz, one of the Chilean abuse survivors who met the pope in April, told the New York Times in late August that Pope Francis had mentioned in conversation Archbishop Vigano and the Kim Davis meeting. “I didn’t know who that woman was, and he snuck her in to say hello to me — and of course they made a whole publicity out of it,” Pope Francis said, according to what Cruz told the Times. “And I was horrified and I fired that nuncio,” Cruz quoted the pope as saying. In reply, Archbishop Vigano gave a three-page statement to LifeSiteNews, one of the outlets that originally published his 11-page text calling on the pope to resign. In the statement, the archbishop claimed he had briefed the pope on who Kim Davis was and received approval for the meeting from the top advisers to Cardinal Pietro Parolin, Vatican secretary of state. But Father Lombardi and Basilian Father Thomas Rosica, who was assisting Father Lombardi at the time, said Archbishop Vigano gave them a different account of his meeting with the pope the next day. With Father Lombardi’s approval, Father Rosica published a statement Sept. 2 based on his notes about their meeting with Archbishop Vigano. 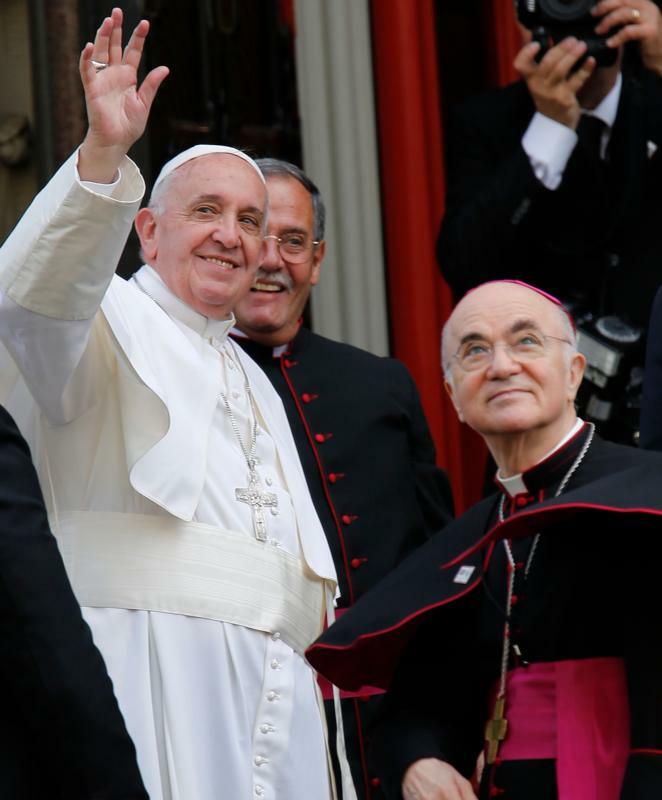 “After meeting with Pope Francis on Oct. 9, 2015, Archbishop Vigano summoned Father Lombardi and Father Rosica to his apartment on Saturday evening, Oct. 10. Both of us were surprised to see that he had maintained his apartment in the old residence of Santa Marta in Vatican City,” the statement said. He also quoted the archbishop as saying, “The Pope told me: ‘You never told me that she had four husbands,'” which could indicate the pope believed Davis’ actions were not completely about defending the sanctity of marriage. Really??? … Fr Rosica said that Archbishop Vigano told them ‘verbatim’? … and then ‘quoted’ the archbishop on something else?